Most of the advice on meetings concerns how to run them. But what about when you’re attending the meeting rather than running it, and the meeting is endless or boring? Certainly, it can help to stay tuned in by asking questions, proposing ideas, and taking notes. Anything you can do to actively participate will help you get through it. Another thing that can help is doodling—that sort of aimless, spontaneous sketching or drawing using whatever paper and writing implement you have handy. I didn’t expect to see doodling as a recommended technique for getting through meetings, but indeed it is. Doodling can actually help you focus and make it easier to listen. It can relieve stress and improve productivity. It can also help in memory retention; doodle a number or word or image that pertains to what’s being addressed and it’s more likely to stay with you. And there’s no such thing as a mistake; they are your doodles, and whatever you create is just right. It may not even matter if the doodling relates to the topic being presented. In one study, people who doodled during a long, boring voicemail message better recalled the details of the message later on than people who didn’t. Researchers speculate that doodling helps the brain remain active compared to the strain of paying single-minded, continuous attention. Although doodling may be beneficial to the doodler, there’s a downside. For the person who’s speaking at a meeting or in a workshop, your doodling can be distracting and annoying. While you may be skilled at texting or browsing the internet while holding your phone in your lap where the speaker can’t see it, doodling is usually a visible, table-top activity. The unavoidable impression is that the doodler isn’t paying attention. Therefore, if you’re determined to doodle, it may be thoughtful to let the speaker know in advance that doodling helps you pay closer attention to what’s being presented and you’ll get more out of the material if you doodle while listening. 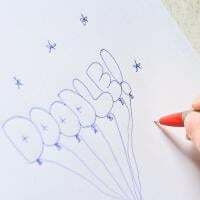 If you’re a novice doodler and would like some inspiration, check out this video. Once you’ve learned the basics (or if you’re naturally talented doodler), try your hand at more advanced techniques, such as doodling cartoon characters or turning words into doodles. Who knew that doodling could be the key to improved productivity and concentration?